It’s already the middle of the month and this is only fourth review this year. January is usually less active comparing to the end of the year. However, I have notice more activity in the last weeks. Have you already found any interesting program this year among those monitored on DaviDnews.com or anything else, which is not yet monitored here? In any case, I guess you are here for some additional information and I’m going to provide it! Today I’m going to review a program called BIST Invest. It has been online for 174 days in total, but only recently it joined the Standard Listing on DavidNews. I have been monitoring this program already for 6 days and now have reinvested $200 to keep you updated on the payment status. As usual, a brief intro about the investment plans. In fact, this time it will not be easy to be brief because BIST Invest offers nine investment plans. In order to keep it short, I will take a look at the plans, which in my opinion are worth considering - BIST, AMEX, and NYSE. The plan BIST offers daily profit of 1% for 30 days. Minimum deposit in this plan is as low as $10 and maximum $1000. The plan AMEX with a minimum investment of $200 and a maximum investment of $2000 offers 2% daily profit for 60 days. While plan NYSE offers 3% daily for 90 days with a minimum investment of $3000 and a maximum investment of $300000. The initial deposit is returned at the end of the investment term for all three plans. The downside is that profit is calculated only during the work days. From the minimum deposit rates, I already can tell that the highest potential has the plan BIST due to its minimum deposit rate while it’s way higher in other two plans. I would put these plans into the category of midterm plans. However, even though I suggest ignoring the other six plans, they are still available for potential investors. Therefore, feel free visit the website and look yourself. 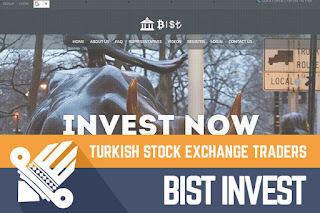 When I first opened the website, I thought that BIST Invest is a real American HYIP. Homepage slider filled with images of American flags, Wall Street street sign, New York Stock Exchange etc. But then I scrolled down to find the registration information and contact details. And yes, my American dream disappeared. BIST Invest is in Istanbul- based company. BIST Invest call themselves a well-known investment cooperation which focuses its activity on Istanbul Stock Exchange. Apart from BIST Invest vision, mission, and goals the About as page also provides an answer to the American themed website. Recently they have been started trading in stock markets of US. No matter how successful they claim to be, they didn’t manage to distract me from finding companies’ registration details. Unfortunately, I didn’t succeed. The overall design of the website looks quite nice. It is not overcrowded with unnecessary information; however, I believe there is large space for improvements in terms of web design. I had this feeling that some sort of template has been filled with content without having a clear goal of overall impression. The website opens in English, but there is also a Google translation drop-down menu with a large list of translations. You can find 4 videos about the BIST Invest on 4 different languages – English, Spanish, Russian and Arabic as well. Most likely they are video reviews from affiliate partners or paid reviews. On the homepage you can also find investment stats. However, keep in mind that such stats shouldn’t be taken into consideration. BIST Invest seems to be keen on communication, they are regularly posting on Twitter and they offer various communication options offline chat, phone, WhatsApp, email. BIST Invest is offering a 5% referral commission and 10% representative commission and other financial bonuses to regional representatives. They have devoted a whole page to regional representation, adding names and contact info for regional representatives around the world. While writing this review I also decided to take a quick look and find some facts about the age of this program. First, communication about BIST Invest has begun only in November of 2017. Second, yes there are twitter posts on their profile since 26th of July 2017 but you can see that post frequency has increased in December last year. Therefore, the profile could have been created earlier to make the desired impression of an old program. Third, the website had at least one redesign during the past 5 months. Sure, we see on our monitor that all kind of programs stops paying and sleepers doesn’t always mean that program is worse than other programs. These are just facts, so you can make up your mind. I already shortly described the investment plans of BIST Invest. There are 9 plans in total – only three worth looking at. Let's look closely to one of them to find out more about financial opportunities. For example, deposit of $200 in the plan called AMEX (2% daily for 60 days) would be making net profit approximately 43 business days. Amount might change depending on the day deposit is made. Therefore, at the end of the 60-day plan (43 business days) the net profit would be $171,43. Tricky, isn’t it? Keep in mind that it’s important to understand the real benefit for each investment plan. BIST Invest accepts the following payment options Perfect Money, Payeer, Ethereum, bitcoin, advcash, and litecoin. The minimum amount of withdrawal is $0.10 (Perfect Money, Payeer, and advcash) and no limit for maximum withdrawal. Withdrawals are processed within one business day (weekdays, working hours). We are looking at a sleeper HYIP, which seems to have an unconditional love for America and large variety of investment plans. In my opinion, there are only 3 plans worth considering with 1%, 2% and 3% daily profit (business days only). The downside of these plans might be the fact that deposit is returned at the end of the plan, which might cause large sums of money leaving the program. Of course, only in case there are many active deposits and in case there are many investors, which end their plans on the same day. Remember to evaluate all possible risks and do your own calculation to understand the real benefits of each plan. Except all what I wrote here, it’s impossible to predict the future of such a simple but at the same time a complex program in a long term. Therefore, if you ever decide to make any investments, don’t invest more than you can afford to lose! Have you already made an investment in BIST Invest? Anything worth sharing? Drop a message in the chat box! Investment plans: 1% up to 3% daily for 30 up to 90 business days, initial deposit returned at the end of the investment term. Ignore other investment plans.